With 70 stores in the Republic of Ireland and 56 in Northern Ireland, the SUBWAY® restaurant chain has rapidly expanded to become Ireland's largest submarine sandwich franchise. With the company's stated aim to develop its UK and Ireland network to 2,010 stores by 2010 (earlier this year Subway topped 1,000 locations across the two countries), Subway is seeking to capitalise upon its growing popularity by bringing on board more franchisees. 'The Subway chain's popularity among consumers has seen sales of Subs continue to rise,' reveals Kevin Graham, Regional Director for Europe, Israel and South Africa. 'If all the Subs that were bought in the UK and Ireland in the last year were laid down they would reach from the UK to Australia, where Subway also recently opened its 1,000th store! In just the last two years the UK and Ireland Subway network has doubled its number of stores and now provides more than 15,000 jobs. In fact the chain, which already has more stores than KFC, Pizza Hut and Burger King, is currently opening an average of six stores a week. 'The Subway chain now has more outlets in Northern Ireland than McDonald's and it is anticipated that we will overtake McDonald's in terms of store count across the whole of the UK and Ireland by mid 2008,' adds Kevin. 'The rapid expansion of the Subway chain is set to continue with a further 300+ franchises sold and therefore that number of stores waiting to be developed. Subway takes a flexible and adaptable approach to the physical layout of its outlets, which enables it to open in a wide range of locations including large shopping centres, smaller town centres, retail parks, universities and convenience stores. With no need for grills and fryers, a Subway franchise is able to open in many properties where other food operators are not able to operate. In fact, one of Subway's key product advantages is that its Subs are made fresh in front of the customer, exactly the way they want it. 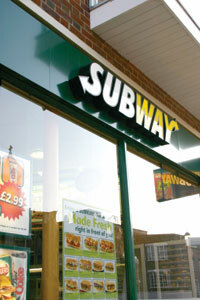 Globally Subway now has more than 28,400 locations in over 86 countries. It reached the 1,000 store mark in the UK and Ireland earlier this year with the opening of three stores, including one in Donegal opened by franchisee Damian McColgan. The Subway chain continues to increase its presence in Ireland and is providing serious competition for other fast food outlets, offering a healthy alternative to greasy and fatty takeaway foods.